I read this for my online book club, and I didn't really enjoy it. I've never read a Poirot book before, and this is only my second Agatha Christie book. I liked the previous one, The Murder of Rogery Ackroyd, a lot better than this. It hasn't put me off totally, but this was just really dull. I think a lot of people know the story but in case you don't, Poirot is travelling across Europe on the Orient Express when he is awoken one night by a banging in the compartment next to his, which is occupied by a Mr Ratchett. Ratchett had earlier told Poirot that he was in fear of his life and had asked for his help, but Poirot didn't like his face so declined to help. Poirot hears someone speaking in French to a train employee, and is aware that the train has stopped, but soon goes back to sleep. In the morning it turns out that Ratchett has been murdered and several clues have been left. 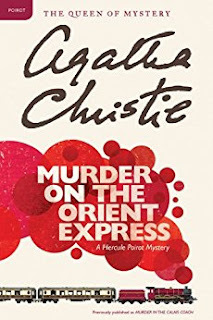 Everyone has a story to tell Poirot and his comrades in the investigation, M Bouc, a director of the train company, and the train doctor, whose opinion it is that several of the stabbings to Ratchett have come from lefthanders and that a woman couldn't have inflicted them all. The first clue gives an indication of who Ratchett really was - a man who kidnapped and then killed the child of a wealthy family but who escaped justice. In the course of their investigation it becomes clear to Poirot and the others that basically everyone in the carriage had a motive to kill the killer of the Armstrong child. Eventually Poirot gathers them all together in typical fashion to lay out his two solutions to the crime. I felt like this hasn't aged well at all. I understand that crime forensics were in their infancy but seriously nothing was done in a proper way. The assumptions of Poirot, M Bouc, and the doctor were just ridiculous at the best of times and bordering on racism at the worst. Also, they just seemed to assume that everyone was telling the truth most of the time, like when they were alibiing other people. It was ridiculous! It took me forever to read and I felt the ending was unsatisfactory. Fortunately, the others in the book club felt pretty much the same! Oh well, you can't like them all!